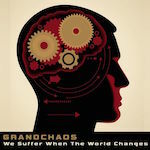 Here we have the fourth full-length album from Tcheleskov Ivanovitch’s Grandchaos; with eleven new tracks and five remixes, to make this a more value for your buck release. Blending some key old school construction alongside simplistic, yet clinically relevant electronics is the main staple of GC’s output; and musically this does work well throughout. The main issue which doesn’t sit so well for me are the vocals, which whilst competent, play far too much into older Front 242 territory; and whilst this worked for a lot of older artists, slumps at the first hurdle by sounding a tad out of date on newer artists circa 2014. The one thing that I do like about GC is that musically speaking, the simplicity in the off-key changes provides an altogether more interesting journey than say, your normal 4-4 approach that has been taken on by other artists in the same ilk. When a standard flow of dance takes hold, Tcheleskov throws in enough curveballs to keep things from going stale. The remixes on the release provide alternate versions of the originals, rather than giving a full alternative proposition; and for me I would have preferred someone not cut from the same cloth with maybe the odd noise or ambient version to give some variation. Nonetheless, these are more than competent in the grand scheme of things. Overall, ‘We Suffer…’ will give comfort to a lot of European fans that refuse to let go of the old Industrial umbrella under which they shelter. As an album, this release does suffer in refusing to submit to modernity, whilst still trying to dabble with a 21st century approach; and I would like to see future endeavours either take a further step backwards or pick up the mantle and bravely move forward, rather than sitting in the middle. This entry was posted in EK Product. Bookmark the permalink.